(by Shawn Snow, Military Times) – U.S. military officials in California have conducted a test launching more than 100 micro-drones from three F/A-18 Super Hornets, the largest-ever test for the cutting-edge “swarm” technology, defense officials said. The swarm consisted of 103 Perdix micro drones, which are small, low-cost, battery-powered devices, launched from three separate Super Hornets [fighter aircraft]. The exercise was conducted at China Lake, California, by the Pentagon’s Strategic Capabilities Office, or SCO, [which focuses on developing new technology] working with Naval Air Systems Command. 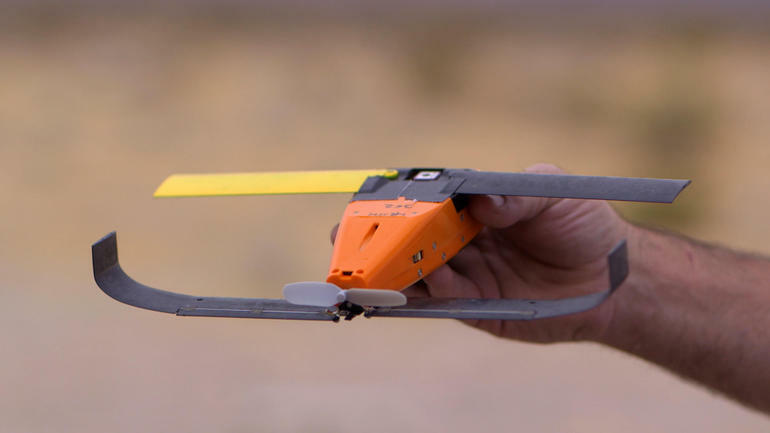 The micro-drones demonstrated advanced swarm behaviors such as “collective decision-making, adaptive formation flying, and self-healing,” according to a Defense Department statement Monday. “This is the kind of cutting-edge innovation that will keep us a step ahead of our adversaries. This demonstration will advance our development of autonomous systems,” Secretary of Defense Ash Carter, who created the SCO in 2012, said in the statement. The test was conducted in October and aired on Sunday’s CBS News program 60 Minutes, according to a Defense Department (DoD) press release. Developed by engineering students at the Massachusetts Institute of Technology [MIT] in the Aeronautics and Astronautics Department; Perdix drones were eventually modified for military application at MIT’s Lincoln Laboratory in 2013. Reprinted here for educational purposes only. May not be reproduced on other websites without permission from Military Times. 3. What are Perdix drones able to do? How do they work? 4. a) What is the role of the Secretary of Defense? b) What did Defense Secretary Ash Carter, who created the SCO in 2012, say about the Perdix? 5. Who/where was the Perdix developed? 6. Watch the videos under “Resources.” What do you think of this technology? – are you inspired, amazed, concerned, etc.? Explain your answer. 7. Our first thought upon seeing this news report was: Why is the government publicizing this information to our enemies? What do you think about this strategy? Explain your answer.